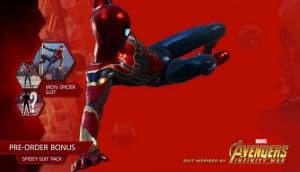 Spider-Man PS4 Iron Spider Suit Leaks | Nerd Much? It looks like somebody jumped the gun over at the PlayStation public relations team. A video was published early today on the PlayStation YouTube channel showing the second costume of three for those that preorder Spider-Man on PlayStation 4. And it’s a glorious rendition of the MCU Iron Spider suit. When the Spider-Man release date was announced by Game Informer last Wednesday, the preorder bonus system was disclosed as well. Those that purchased early would be entitled to three additional costume variations for your friendly neighborhood hero. The only one revealed at that time though was the Spider-Punk suit. The first iteration of the Iron Spider suit in Spider-Man’s lore stems from the 2005 and 2006 “The Other” comic. Just as in the MCU, Tony Stark develops the suit for Peter Parker. A suit that famously utilizes three metallic spider legs stemming from its back. While the comic version of the suit was crimson and gold throughout to match Iron Man’s motif, the MCU version retains Spider-Man’s iconic red and blue. Although there is plenty of gold thrown in for affect too. We’ve yet to see Parker put on the Iron Spider suit in the MCU. But he is shown wearing it in the trailer for Infinity War. So we don’t really know what the suit is capable of in future movies. It’s unclear yet if the Iron Spider suit will have any effect on gameplay or whether it’s merely for aesthetics. It would be damn shame though if the loveable A.I. Karen didn’t come with the outfit. We’ll have to wait on the official word from Sony to find out (spoiler, it won’t). Spider-Man for PlayStation 4 ships worldwide September 7th.